That's a cool idea. I don't miss stamps myself, but your idea is wonderful. Great illustration. 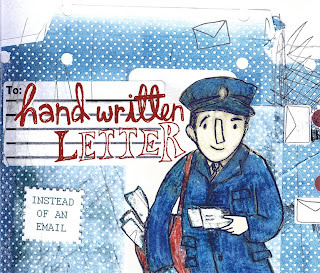 This is really nice illustration, I like writing hand written letters, and of course, receiving them. Like the way you've done this with the blue spotty background. I love getting a letter but it's all too rare now. Good to see some kind of non digital art! I like this letter, very much! brill katie. i like how you are completing a beautiful piece of work every week. love the texture of the colouring in. dx. Love your hand lettering and your use of the inside of an envelope, it create a wonderful wintery feel! A posties busiest time of the year.